We would LOVE to help you simplify your home…AND benefit the Williamsburg Symphony at the same time! 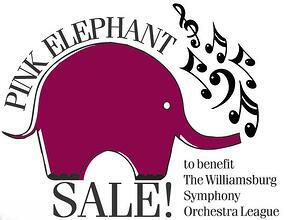 Our first ever Pink Elephant Upscale Sale was a huge success earlier this year in March, raising over $2800 to benefit the Williamsburg Symphony Orchestra League. It was so successful in fact, that we are planning ahead to make our next sale even Bigger and Better! We have our next sale scheduled for December 10th from 10-2 at 5309 Hillside Way in Williamsburg’s Lake Powell Point neighborhood, so we are in full gear collecting gently used items to insure that we have lots of great stuff to sell. Volunteers will be standing by at 5309 Hillside Way on Friday, December 2nd and Saturday, December 3rd from 1-4pm to collect your items. We are happy to arrange pick up for generous donations of furniture or larger items. We will provide receipts for tax deductions. Our best sellers were definitely furniture of all sorts, lamps, jewelry, art and kitchen items. Please help us get the word out...if you or your friends or family are downsizing or moving, (or, just need to de-clutter!! ), contact thepinkelephant@lizmoore.com to coordinate a pick-up or delivery. Please take a walk through your home and see if you have any gently used treasures that it's time to part with...for a wonderful cause of supporting Williamsburg's Own Symphony!